Out in Pittsford there is a huge field of sunflowers that blooms in August every summer. This year we drove out and took some pictures. 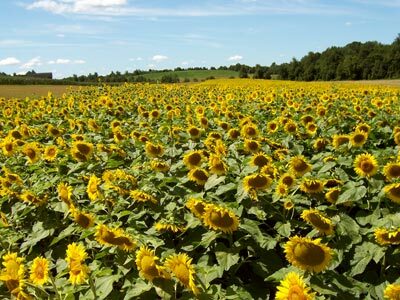 It is truly sunflowers as far as the eye can see. The sunflowers were swarming with bees, but they were all drunk on pollen and could care less about us. I took a bunch of pictures and you can see them here. Aaaaaaah! I drove past that field for the first time Friday and was going to go back and photograph them as well! Crazy. Where in Pittsford is this located? I recently moved out to Mendon and now I drive past those fields all the time. Boy was I surprised when what I'd assumed was more corn turned out to be sunflowers! One of these days I'll have to stop and buy some from the little stand they have. I love the sunflowers. There are usually tons in the unused plots of land and intersections around here. (They're considered weeds in TX, if you can believe that.) But this year's drought and temps have caused all but the most hearty to dry up. So sad. That just makes me think of the poppy field scene in Wizard of Oz. Maybe it's cuz I just finished Wicked. Oh this is a lovely field. I thank you for the wonderful gift of these flowers. I will make a screen saver from the picture to make me smile. melissa - You should stop! As long as you aren't allergic to bees. typing girl - the sunflowers are a deal! $1 a flower!